The University of the Philippines (UP) College of Music opens its 2nd semester of faculty concerts with Arwin Tan conducting the Novo Concertante Manila on Friday, November 15, 2013, 6:30 in the evening, at the Abelardo Hall Auditorium. 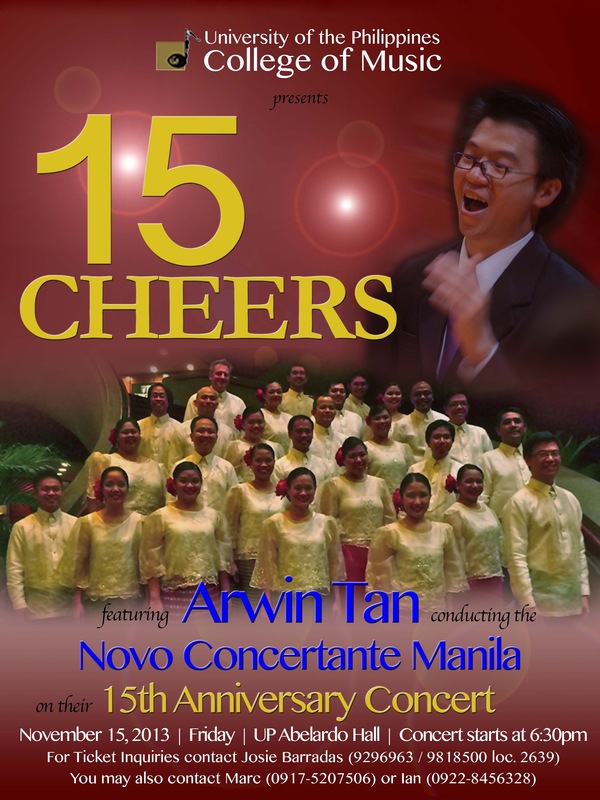 The concert is entitled “15 CHEERS,” to highlight the celebration of the 15th anniversary of the founding of Novo Concertante Manila, which had its premiere performance at the historic AHA Auditorium during Tan’s student days as a choral conducting major. The choir will feature compositions and arrangements by Ralph Hoffmann (Salve Regina), Jay-el Viteño (Unang Halik), Francisco Feliciano (Pamugun), Eudenice Palaruan (Koyu no Tebulul), Ken Steven (Angele Dei), Javier Busto (Sagastipean), among others. The programme showcases the ‘beautiful sound colors, fantastic virtuosity, and careful attention to dynamics, balance, sound, rhythm, and intonation’ that the choir has constantly tried to achieve, as hailed by international music critics from Hungary, South Africa, Israel, U.S.A. and Sweden. Novo Concertante Manila has been a three-time “Ani ng Dangal” awardee from the National Commission for Culture and the Arts for their outstanding achievements in international choral competitions. Currently positioned as number eight in the World Rankings of the Top 1,000 choirs by Interkultur, Germany, the choir has won the top prizes in prestigious international choral competitions in Spittal an der Drau, Austria; Torrevieja, Spain; Phuket, Thailand; Takarazuka, Japan; and Guangzhou, China. The choir has also been actively involved in their out-reach projects, helping churches and communitites raise funds for their livelihood upliftment projects. Tickets to the show are priced at PhP300 with special discounts to students and the elderly. For further deatils, please contact Josie Baradas at 9296963 or 9818500 loc. 2639.